Retirement is not just about traveling. It is also not just about watching TV at home while waiting for grandkids to visit. Instead, retirement can be a time to explore new things and that can include going back to school. Retirement gives seniors the opportunity to pursue goals that were not feasible during their working years. After all, they don’t have to worry about task deadlines in the office. This is the best time to learn something new and experience opportunities that they may have been too busy to pursue in their younger years. This is why a lot of seniors are now considering the thought of going back to school once again. The stimulation of intensive intellectual immersion is invigorating. Going back to school allows seniors to obtain benefits that their pre-retirement life did not provide. Others simply choose to study for the love of learning. To provide more opportunities for socialization. Seniors will have the opportunity to enjoy events hosted by their chosen college and university. They can take part in sporting events or watch concerts for free. They can also have the chance to sit down in many conferences and conventions afforded to students. They can also have access to athletic facilities, libraries, etc. Things like being able to go to the campus coffee shop with a classmate can already be a wonderful experience for seniors. Some seniors enjoy the thought of being in a classroom with many younger students. Some professors also like their classrooms to have retirees as students. This is because seniors have knowledge that they can share with their younger students. The best thing about it is that much of the information that seniors can share is usually proven by time and experience. Besides, the presence of seniors inside the classroom adds vitality to it. They are never afraid to ask questions or share their funny experiences. To enjoy a second career. For many seniors, retirement is not just about saying goodbye to work days. It can also be about welcoming a new career. A Merrill Lynch study showed that an astonishing 72 percent of older adults aged 50 and older want to work after retirement. The study also showed that years before retirement, these older adults are already taking steps for post-retirement careers. Most of them also prefer to take a break from work for an average of two and a half years before starting a new career once again. And, to make them more capable of launching a new career, they decide to further their studies. Finishing a course will help increase a senior’s chances of getting hired. Their decades of experience already makes them a walking reservoir of wisdom. However, a second degree will prove to help become a more valuable candidate for the new career they’re hoping to get. Sometimes, along with aging aging comes a dwindling self-confidence. Some seniors have low confidence even if they are rich in experience. The presence of younger applicants trying to win the same job they want can be intimidating. But, with a newly earned degree, their confidence and self-worth are improved. This makes them more prepared to venture into a new career despite their age. Success tends to bring more success. Since the economy is moving towards a forward direction, a senior’s skills must also follow suit. Many workers struggle to get promoted because their skills are already outdated. Once skills are updated, a senior is less likely to feel anxious that their dream second job will be lost to a younger applicant. Besides, there is no doubt that updating one’s skills is crucial to this ever fast changing world we live in. Learning advanced skills affords seniors more options and opportunities to keep pace with workplace changes. To stave off signs of cognitive decline. Education and occupation are two factors that greatly prevent cognitive decline among seniors. When the brain is constantly stimulated it is less likely to decline. In other words, you have to constantly use it so you don’t lose it. Keep in mind that new brain growth is still possible even when you are already in your senior years. A study showed that performing activities that keep the brain mentally engaged helped ward off cognitive impairment in people aged 70 and older. Working on a computer and joining activities that provide socializing opportunities are great examples. Audit classes for free or minimum fee. Audit classes are those that you can attend for no credit at all. It does not fulfill any degree requirements. In other words, you will just attend the class without the benefit of getting a grade. What you will gain from these classes would be self enrichment. Others do so for the purpose of academic exploration. In many colleges or universities, audit classes are offered on a space-available basis only. If you choose to enroll in it you have to seek approval from the instructor and from the dean. Some schools offer audit classes for free. Others will ask you to pay credit fees as if you are a regular student. So, if you are on a tight budget, it is best to look for a school that offers it for free. The best thing about taking audit classes that you will have the chance to learn more without the pressure of submitting requirements and exams. 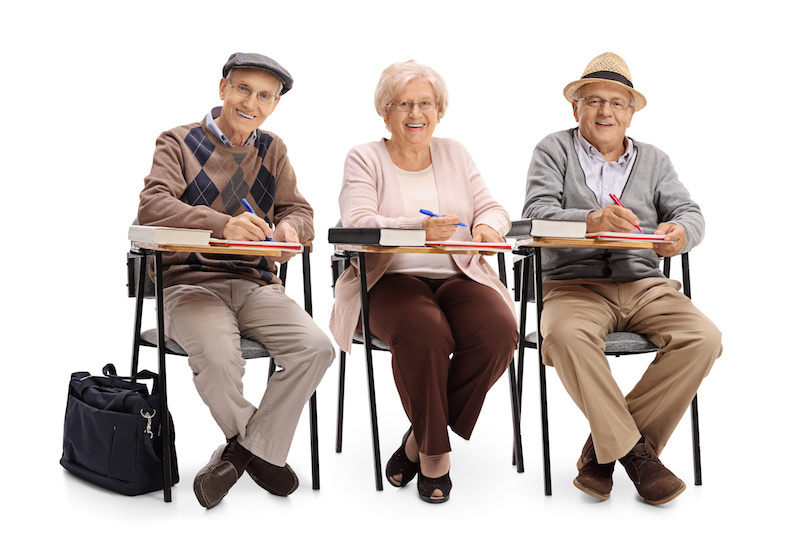 In Florida, free audit classes are offered to senior residents. One requirement would be they are residents of Florida for at least a year. Seniors may inquire about this at the University of Central Florida. Although full-time regular students are a priority, seniors can still be in these classes whenever there are extra seats. There are colleges which offer retirees free courses. For example, in Massachusetts residents aged 60 and above may enroll in any undergraduate and graduate courses. In the University of Massachusetts, tuition fees are free but seniors may need to pay for other fees. In Kentucky, senior residents can enroll in any state-supported school without the need to pay for tuition fee. They can also have 50 percent discount on books and other school materials at the campus bookstores. Be a member of Osher Lifelong Learning Institute. Members of the OLLI aged 50 years old and above can have access to different kinds of benefits. These benefits vary depending on the school where the senior choose to enroll. Some of these would include access to different OLLI courses and free access to libraries in all UC campuses. It also gives seniors the chance to join OLLI national and international trips. Seniors who prefer to be home-bodies once they’ve retired, may take courses online. This way, they won’t have to leave the house in order to take on more learning. EdX and Coursera are examples of online schools that offer specializations and other courses to all regardless of age. The lessons and learning materials are usually provided by professors from reputable universities. Of course being in school as a senior is not all a bed of roses. You may also meet some obstacles and challenges. But, rest assured that none of these are insurmountable. Some seniors find it intimidating to be in school and be surrounded with younger people. Many seniors have this first impression that their younger classmates don’t want to befriend them. If others make you feel like you don’t belong in that school or class, ignore them. Some seniors are required to take up certain subjects or courses before they can qualify for the school’s basic entry requirements. Prerequisites are a part of the education process for all students. Often times prerequisites can be fulfilled at Community Colleges at a reduced cost. Some seniors who want to earn a diploma after retirement may struggle to overcome their study skills. They like their chosen course but it’s just that their study skills are no longer as efficient as it were in their younger years. Even if you are only auditing a class, it can still cost you some money. This is true especially of schools who still require seniors to pay tuition even if the senior will just be auditing the class. Besides, even if the tuition is free you still need to spend something for transportation. Not to mention the fact that a cup of joe in campus coffee shops are not for free. As mentioned earlier, no obstacles are insurmountable. Below are some tips to help you overcome some obstacles when going back to school. Go for it no matter what. If you are really determined about continuing your education in retirement then go for it. Never let anything get in the way of your dream of earning such degree. Remember that the rewards of studying go beyond what that diploma affords. It can make your life so colorful. It makes your retirement years so rewarding and fulfilling. When they ask you to take prerequisite classes, go for it. Remember that its benefits far outweigh all the difficulties that you may encounter. Talk to guidance staff and course professors to gain first-hand information about the course that you plan to take. This way, you will have a heads-up of what your chosen course entails. Don’t get affected by 20 year olds looking at you as if you don’t have the right to be in the same school as them. Remember that you are there because the school is allows you to be there and likely your tax dollars have contributed to the success of that school. You are there because you are qualified. So, ignore those stereotypes and never let it get in the way of your dream of earning that degree. Work on your study skills again. Remember that studying is a skill. This means that there are many ways to improve should you find yourself falling short of such skill. Explore the internet and discover ways to improve your study skills. Figure out the way you learn best. Record and re- listen to lectures, organize study groups, make flash cards and see your instructor during office hours. Almost all programs offer study labs where advanced students are available for free to help other students. Often students will do their homework in a lab where there is someone readily available to help if needed. Lastly, working with a hired tutor can give your study skills a boost. Start saving for your school days. While you are still waiting for scholarship or loan grant, start saving. Think about where you can cut corners in terms of your personal budget. Remember that coffee and sandwich time in the campus cafeteria could also mean added expenses. Do you have a stash of spare coins? Now may be the time to put them to use. Make sure you’re heart is in it. Choosing a course that is not within your field of interest may only make studying more difficult for you. Note that changes and adjustments may be a bit harder for you to do now that you are in your senior years. But, if you’re in it because it’s what your passion dictates, everything becomes so much easier. Remember that this time you are not just in it for monetary reasons. You are also there because you want your retirement years to be more meaningful. Opt for online education instead. Online education or distance education is a great option for seniors who do not have easy access to colleges and universities. This option is also suitable for seniors who have mobility issues. Plus, seniors can work at their own pace and usually they can choose to take up their classes anytime they want. This is because many lessons are accessible 24/7 as long as there is access to internet. The best thing about online or distance education is that seniors have almost endless choices as courses are available from most universities.